Radiolab has a fascinating episode on the Fugo balloon bombings. During world war II the Japanese used balloons made partially out of paper to bomb the US. 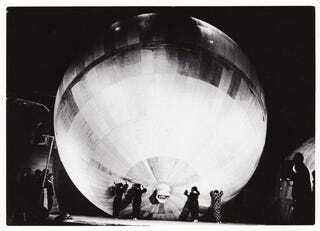 They would put the balloon in the jet stream and through pretty amazing engineering they got it to the US. But, it just wouldn't be Radiolab if they didn't talk about the human side. You hear from a Japanese woman who was one of the school girls who helped fold paper for the balloons, there is how a sheriff caught one balloon, and the heartbreaking story of a town in Oregon who was effected by the bombings. Radiolab also has some pictures that you can view. I suggest at least looking at those if you don't have time to listen.